Rising Brookie is exactly what the name implies. This magnificent fish with its bright colors rises to take a Royal Wulff fly, which will delight the angler. 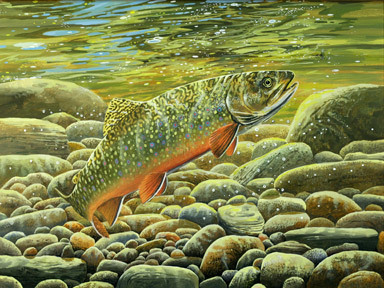 Fly fishing is marked by the delight of catching fish of sparkling color and this painting evokes those memories. This painting is acrylic on canvas and measures 24″ wide by 18″ high and was sold immediately upon completion. For gifts or to enjoy in your own home, giclee prints of this painting are now available.